Boeing announced a partnership with Aerion Corp. on February 5 and further made a “significant” investment in the Reno, Nevada-based supersonic business jet (SSBJ) developer that aims to “accelerate technology development and aircraft design, and unlock supersonic air travel for new markets.” While financial terms of the deal were not disclosed, sources with knowledge of the deal told AIN that Boeing invested several hundred million dollars for an approximate 40 percent share in Aerion. This replaces Lockheed Martin as Aerion’s aircraft manufacturing partner for its Mach 1.4 AS2 SSBJ—a development that, when announced in December 2017, displaced Airbus from this central position. Under last month’s agreement, Boeing will provide engineering, manufacturing, and flight-test resources, as well as strategic vertical content, for the AS2. The Seattle airframer’s contingent on the board consists of Boeing Commercial Airplanes v-p of product strategy and future airplane development Mike Sinnett and Boeing Global Services v-p of supply chain Ken Shaw. Meanwhile, Tom Vice, who was elevated at Aerion to president and CEO, as well as a board member, in August, has added the title of chairman. Boeing has long held ambitions for a civil supersonic transport (SST), working on small-scale SST studies in the early 1950s before starting a full-fledged SST program for its delta-wing, Mach 3 Model 2707 a decade later. That program was canceled in 1971 before the two planned prototypes were built. Since then, Boeing has dabbled in high-speed civil aircraft, unveiling the near-supersonic Sonic Cruiser in early 2001 and then shelving it a year-and-a-half later. In June, the company revealed an illustration of a hypersonic passenger concept airplane. 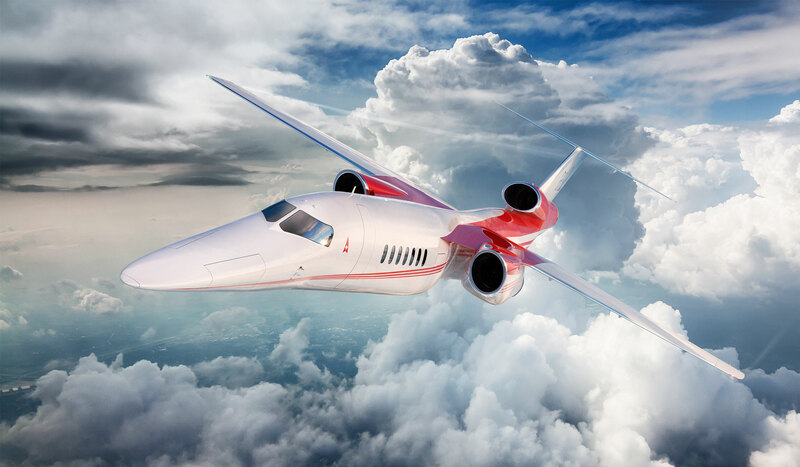 Meanwhile, Aerion brings more than 16 years of continuous, dedicated supersonic research and development to the table, as well as no fewer than 22 U.S. patents for supersonic technologies it has developed since then. Its patents include many for laminar flow aerodynamics—a key technology that Aerion has touted for the AS2’s wing. Over the years, the company has partnered with NASA to flight test and subsequently refine many of its laminar-flow concepts. While other proposed supersonic aircraft seek to mitigate the sonic boom via aerodynamics, the AS2 will use “boom mapping” software to allow for overland cruise at speeds up to Mach 1.2 without the boom reaching the ground. This "Boomless Cruise" feature takes advantage of Mach cutoff, where the boom itself does not extend all the way to the ground, though the speed at which this happens varies with atmospheric conditions. The software could ultimately take the form of a flight deck display similar to weather radar that can show pilots when the boom is getting too low for comfort (5,000 feet above ground level is thought to be a sufficient buffer). The AS2 is now in the preliminary design phase, with Aerion and Boeing engineers now working to finish this phase by late 2020. “We’re making good progress,” said Aerion’s Miller. Once the design is finalized, Aerion will start cutting parts for the first prototype. Notably, the change in manufacturing partners does not affect the timeline for the $120 million AS2, with first flight still slated for 2023, nor Aerion’s decision to use the GE Aviation Affinity engine to power the aircraft. But the addition of Boeing as a partner has had a positive effect on sales interest, said Miller. “People are taking notice of this serious commitment from Boeing.” And while he wouldn’t disclose the backlog for AS2s, Miller said there is continued interested from buyers. 3 different partners in a year. This has to be sign of a desperation. This is the longest running fraud and scam in aviation. Decades have passed, hundreds of millions of dollars have been given to these Aerion con men and NO metal has been rivited, NO prototypes have flown. It is sad that this is given any credibility by the aviation press. Developing supersonic civil aircraft is neither an easy nor inexpensive task. The road is littered with unfinished/failed supersonic designs from well-financed business and commercial aviation OEMs, including Boeing, Gulfstream, Dassault, and Sukhoi. Aerion has taken a slow and steady approach and should not be penalized for taking the time to do proper R&D instead of rushing ahead to rivet metal and fly a prototype that could never get certified. I'd posit that any company rushing to slap a prototype together to build up hype is the one most likely to not be on the up and up – consider the history of Eclipse Aerospace, here. Aerion is no Eclipse.